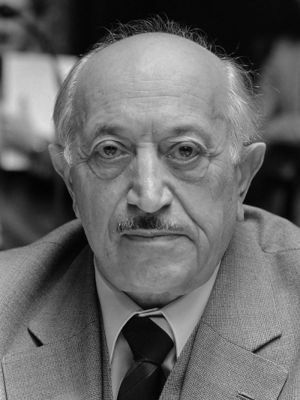 سيمون ويزنتال Simon Wiesenthal ‏(31 ديسمبر 1908 – 20 سبتمبر 2005) كان نمساوي يهودي ناجي من المحرقة، وصائد النازي وكانب. He studied architecture and was living in Lwów at the outbreak of World War II. He survived the Janowska concentration camp (late 1941 to September 1944), the Kraków-Płaszów concentration camp (September to October 1944), the Gross-Rosen concentration camp, a death march to Chemnitz, Buchenwald, and the Mauthausen-Gusen concentration camp (February to 5 May 1945). After the war, Wiesenthal dedicated most of his life to tracking down and gathering information on fugitive Nazi war criminals so that they could be brought to trial. In 1947 he co-founded the Jewish Historical Documentation Centre in Linz, Austria, where he and others gathered information for future war crime trials and aided refugees in their search for lost relatives. He opened the Documentation Centre of the Association of Jewish Victims of the Nazi Regime in Vienna in 1961 and continued to try to locate missing Nazi war criminals. He played a small role in locating Adolf Eichmann, who was captured in Buenos Aires in 1960, and worked closely with the Austrian justice ministry to prepare a dossier on Franz Stangl, who was sentenced to life imprisonment in 1971. اقرأ اقتباسات ذات علاقة بسيمون ويزنتال، في معرفة الاقتباس. Finkelstein, David (20 August 2009). "It is right to expose Wiesenthal". The Jewish Chronicle Online. Retrieved 14 December 2012. Garner, Dwight (2 September 2010). "Simon Wiesenthal, the Man Who Refused to Forget". New York Times. Retrieved 2 June 2015. Staff. "The Art of Remembrance – Simon Wiesenthal (1994)". The New York Times. Arthur Ochs Sulzberger Jr. Retrieved 16 December 2012. Staff. "Simon Wiesenthal Archive: Filmography". Documentation Center of the Association of Jewish Victims of the Nazi Regime. Retrieved 14 December 2012. Staff (27 February 2002). "Julius Viel, 84; Former Nazi Officer Convicted of Murdering Jews". Los Angeles Times. Eddy Hartenstein. Retrieved 5 January 2013. Staff (20 September 2005). "Simon Wiesenthal, 'conscience of the Holocaust,' dies at 96". Haaretz. Amos Schocken. Retrieved 5 January 2013. Staff (20 September 2005). "Simon Wiesenthal to be laid to rest Friday in Herzliya". Haaretz. Amos Schocken. Retrieved 5 January 2013. Staff (3 February 2011). "Simon Wiesenthal, Israel-Austria Joint Issue". Stamp Community Forum. Retrieved 5 January 2013. * Wallace, Julia (15 May 2007). "'I Have Never Forgotten You: The Life and Legacy of Simon Wiesenthal'". The Village Voice. Michael Cohen. Retrieved 16 December 2012. Wong, Curtis (30 October 2014). "Tom Dugan Examines The Heroic (And Comedic) Side Of Simon Wiesenthal In One-Man Show". Huffington Post. Retrieved 2 June 2015.